1 ampoule or 1 vial of Onko BCG 100 contains not less than 300 million of live BCG. Powder and solvent for suspension to administration to urinary bladder. White or cream-coloured, dry, formless powder. The product is intended for treatment of superficial, epithelial non-invasive urothelial carcinomas (carcinoma urotheliale Ta, Tis, T1). The product should not be used in case of invasive bladder carcinoma, as chances for recovery are scarce. Onko BCG 50 may be administered in case of recurring side effects (dysuria, increased body temperature) or increased size of induration (tuberculin reaction). 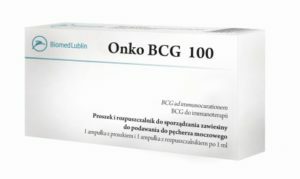 One dose of Onko BCG 100, corresponding to 1 dose used for 1 intravesical infusion, comprises the content of 1 ampoule or 1 vial (100 mg) reconstituted in 1 ml of isotonic sodium chloride solution. Add 1 ml of the solvent (sterile isotonic sodium chloride solution) to an ampoule or vial containing the powder, using a 5 ml sterile syringe. Carefully aspirate three times and release again ampoule or vial content, in order to obtain homogeneous suspension (avoid shaking and frothing the suspension). Next, collect the suspension from the ampoule or vial to a sterile 50 ml syringe and add 49 ml of sterile isotonic sodium chloride solution. After reconstitution, homogeneous suspension without discernible conglomerates is obtained. Using a 12-14F catheter inserted via urethra, remove urine from the bladder. Slowly introduce the entire portion of BCG suspension (50 ml) via the catheter and administer 5 ml of sterile sodium chloride solution, in order to completely remove BCG suspension from the catheter. The patient should not drink any liquids for 3-4 hours prior to and 2 hours after administration of the product. Remove catheter after product is administered. Instilled BCG suspension must remain in the bladder for 2 hours; during that time, the patient should change his/her body position (on the stomach, on the back and on the sides) every 15 minutes, and after 2 hours he/she shall void the bladder. The suspension should be administered to the bladder not earlier than 14 days after taking a biopsy specimen from the tumour or mucous membrane of the bladder or after transurethral resection of bladder tumour (TUR). The procedure should be performed once a week, for six consecutive weeks, and followed by recommended maintenance treatment every 3 months, once a week for three consecutive weeks. In case of diagnosed tumour recurrence, the 6-week treatment should be repeated. Before commencing treatment, intradermal tuberculin test (tuberculin sensitivity test, PPD test) should be given to a patient, in order to evaluate the degree of immune sensitivity of the patient. When induration is highly intense or when its diameter exceeds 1 cm (induration exceeding 6 mm in diameter is treated as positive reaction), planned immunotherapy should be abandoned. After completion of a 6-week treatment, intradermal tuberculin test should be repeated, in order to evaluate impact of the treatment on general immune sensitivity of the patient. In some patients, this sensitivity clearly increases. After 2 hours following drug administration, the patient should be recommended to urinate, and if there emerge problems with complete bladder voiding (urine retention after miction), the patient should be catheterized and retained urine should be removed. After urination, the lavatory is washed with standard disinfectants. –	urinary tract infection, until obtaining urine negative for microbes. The product contains live attenuated bacilli of Mycobacterium bovis, and therefore after completed procedure, all devices and materials (syringes, catheters etc.) should be disposed of in accordance with provisions regarding hazardous waste. Sexual abstinence is recommended within 48 hours following intravesical instillation. Use condoms within at least one week after infusion. The product should not be used intravenously, subcutaneously and intramuscularly. After product administration, an amount of liquid taken in within 24 hours after first urination should be increased. Within this time, at least 12 glasses of liquid should be taken in. Urinate regularly. Lubricants used during catheter insertion should not contain tuberculostatics. Prepare BCG suspension for intravesical instillation immediately before the procedure. Do not use the product in patients simultaneously treated with cytostatic drugs and steroids administered systemically. Topical steroids are not contraindicated in treatment using the product. During BCG treatment, administration of antibiotics with possible bactericidal effect on the bacilli, acetylsalicylic acid (aspirin) derivatives and some antithrombotic drugs should be limited. The product should not be administered to pregnant women. The product should not be administered to breastfeeding women. Effects on ability to drive and use machines have not been investigated. Like all medicines, Onko BCG 100 may cause side effects. Treating of non-invasive bladder carcinoma with products administered into the bladder is well tolerated by majority of patients, however local or general adverse effects may be observed. Lesions with tuberculous granulation tissue in the lungs have been observed. The most common complication are symptoms of cystitis, usually emerging after second or third administration. Pollakiuria, haematuria, painful urgency observed on the day of product administration usually subside after a few hours. More serious side effects of the therapy have been known as well, such as tuberculous inflammation of inner layers of bladder walls, prostatitis and/or epididymitis with caseous necrosis lesions. In patients with tuberculous prostatitis or maintained subfebrile body temperature, a 6-week treatment should be used, with daily administration of two drugs, 600 mg of rifampicin and 5 mg/kg b.w. of isoniazid. 600 mg of rifampicin and 10 mg/kg b.w. of isoniazid. In case of arthritis symptoms, it may be necessary to include corticosteroids. In patients with the aforementioned symptoms of generalized infection, treatment with the product must be absolutely abandoned. In addition to topical reactions, general reactions may also appear, such as: ill-being, short-term increase in body temperature (38°C-39°C), chills, nausea, muscular and joint pain, diarrhoea, pain around sexual organs. General symptoms are usually maintained for 1-3 days. Very rarely, the aforementioned symptoms enforce discontinuation of the treatment and administration of tuberculostatic drugs. Lesions with tuberculous granulation tissue have been observed in liver as well. All more serious adverse effects of intravesical instillation of the product usually subside after four-month tuberculostatic chemotherapy. –	follow all doctor’s recommendations and take drugs prescribed by the physician. In case of administering an excessive dose or too long retention of the product in the bladder, rinse the bladder a number of times with sterile sodium chloride solution. Remove urine retained in the bladder using a catheter (in case of patients with residual urine) and provide tuberculostatics in case of emergence of septic symptoms. BCG has been applied as a non-specific immunostimulating factor in the treatment of some types of carcinoma. Intravesical instillation of BCG is intended to eliminate primary tumour or to delay or prevent its consecutive relapses. Specific mechanism of action of BCG has not been fully explained. It is believed, that the drug stimulates emergence of inflammation in the bladder wall which defends the organism against development of the disease, and stimulates the patient’s immune system. No human toxicity has been confirmed. During tests on laboratory animals (guinea pigs and white mice), no toxicity has been confirmed. No incompatibilities have been observed. Use the product immediately after reconstitution. To protect the product from sunlight, store ampoules or vials in secondary packaging. 100 mg of the powder in an ampoule or vial made of glass type I and 1.0 ml of the solvent in an ampoule made of glass type I in a cardboard box – 1 or 5 items per packaging. Vial stopper is made of chloro butyl rubber or bromo butyl rubber with silicone layer. BCG suspension for intravesical use should be prepared immediately before the procedure. Activities related to performance of the procedure should be carried out in sterile conditions by personnel using sterile gloves, masks and caps. In case of polluting body or any item surfaces with BCG suspension, disinfect the affected site with 70% ethyl alcohol or 2% solution of septyl. After finishing the procedure, dispose of the devices and materials in accordance with provisions regarding hazardous waste.